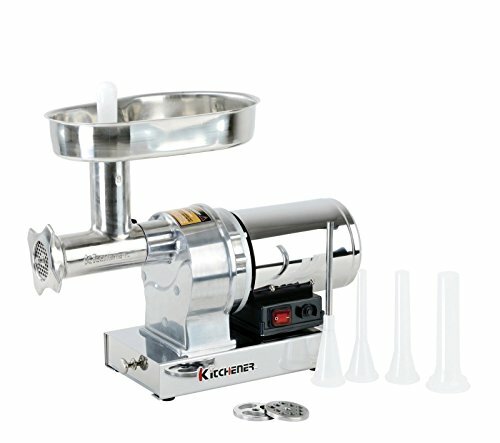 The Kitchener 52020806 #8 Commercial Grade Electric Stainless Steel Meat Grinder 1/2 HP (370W) can grind up to 480-lbs of meat per hour. Great for small restaurants, meat processing shops or anyone wanting a heavy duty grinder at home. It features all heavy-duty stainless steel construction and a patented drawer for accessories storage. The stainless steel grinder head, auger, housing and water-proof switch assure superior safety, as well as being rust-proof. The large-capacity stainless steel meat pan in 13"x9"x2-3/8" with enlarged throat can hold more meat. The steel gear-driven mechanism design and maintenance-free air-cooled motor make the grinding capability more powerful and smooth quiet operation. Equipped with a circuit breaker for safe use. Includes a stainless steel cutting knife, stainless steel coarse (3/8"), fine (3/16") and stuffing plates, four stuffing tubes (3/8", 1/2", 3/4", 1-1/8") and solid meat stomper. ETL certified to UL standards. The steel gear-driven mechanism design and maintenance-free air-cooled motor make the grinding capability more powerful and smooth quiet operation. 1/2 HP (370W) induction motor can grind up to 480-lbs of meat per hour. Equipped with a circuit breaker for safe use. The large-capacity stainless steel meat pan in 13"x9"x2-3/8" with enlarged throat can hold more meat. If you have any questions about this product by Kitchener, contact us by completing and submitting the form below. If you are looking for a specif part number, please include it with your message.